Spring is in the air and our events calendar is filling up. No doubt, kittens will be along very soon too, so we are pleased to welcome some new volunteer fosterers to our branch to help out with the expected influx! Interestingly, over the past few months we have seen an increase in the number of more mature moggies we have been asked to take in. Sadly, these can be much harder to home than the cute, fluffy bundles of kitten fur. Please, if you are thinking of sharing your home with a feline, do not overlook our older residents; they make delightful and rewarding companions. 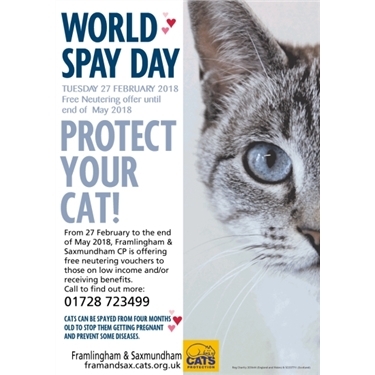 Feline care: World Spay Day is 27 February 2018. Cats Protection together with member charities of the Cat Population Control Group promotes the importance of ensuring felines are neutered at the earliest opportunity. As a cat lover and caring owner, the best thing you can do to protect your cat is to have it neutered. A female cat can get pregnant whilst still a kitten herself. She should be spayed no later than four months old. Neutering your male kitten early will help keep him safe - ensuring that he doesn't get into constant fights over females which will protect him from injury and diseases. It will also stop his urge to wander off in search of a mate and lessen the chances of him getting lost or injured on the road. Neutering also helps the general cat population; the fewer un-planned litters there are, the more homes will be available for the many needy felines which come into our care. A simple 'snip' really does show you care! All kittens adopted from CP will be neutered before being homed, or a free neutering voucher given for kittens if they leave care before they are four months old. From 27 February to the end of May 2018, Fram & Sax CP is offering free neutering vouchers to those on low income and/or receiving benefits (proof would be required when attending participating vets). This offer is also available to help manage feral colonies. Call us on 01728 723499 to find out more. Cat Quotes: Short but very sweet: "Cats are connoisseurs of comfort" -James Herriot (author). 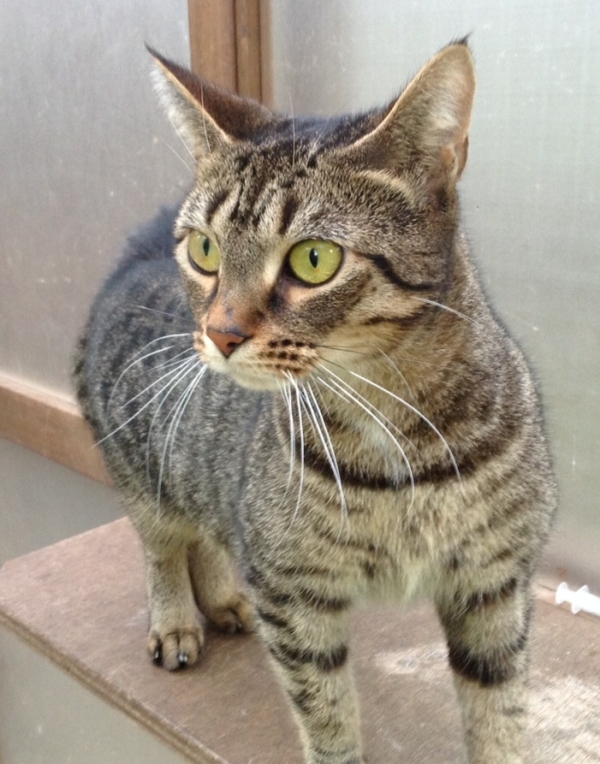 This pretty and petite 2 year old female is Lexi. She is a sweet little puss, very energetic and loves charging around chasing things. Lexi needs a quiet home with no other pets. If you have lots of TLC to spare, please come and see her soon.